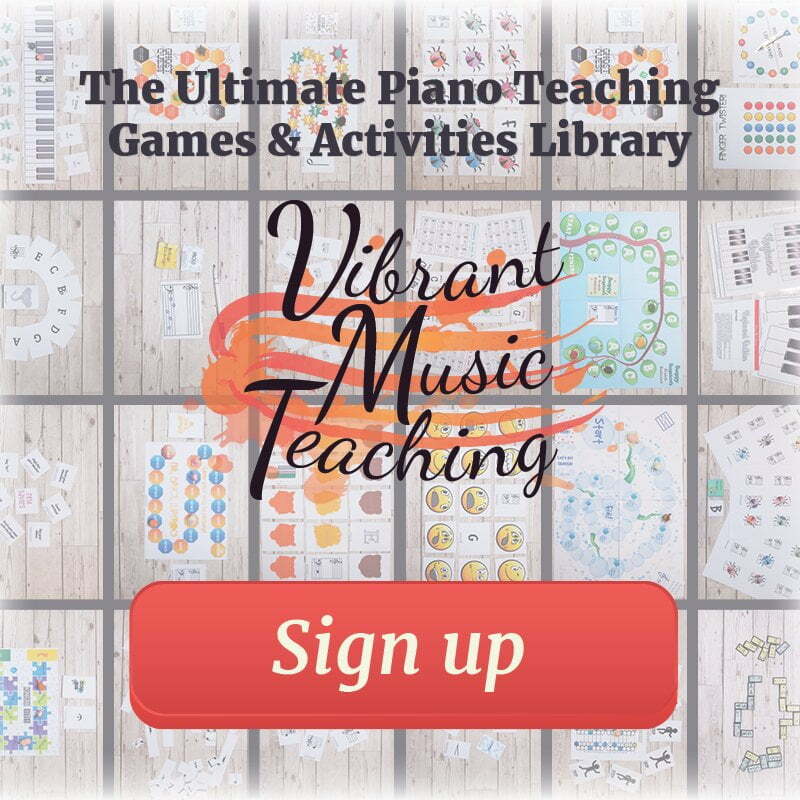 After my post last week ‘7 Benefits of Partner Piano Lessons‘ several teachers requested more info on how exactly I make lesson plans for partner piano lessons. It’s certainly not as straight forward as regular lesson planning. There’s a reason I charge each student 75% of my regular fee (making 150% of individual lesson fees). It takes more time and thought to teach two students at the same time. 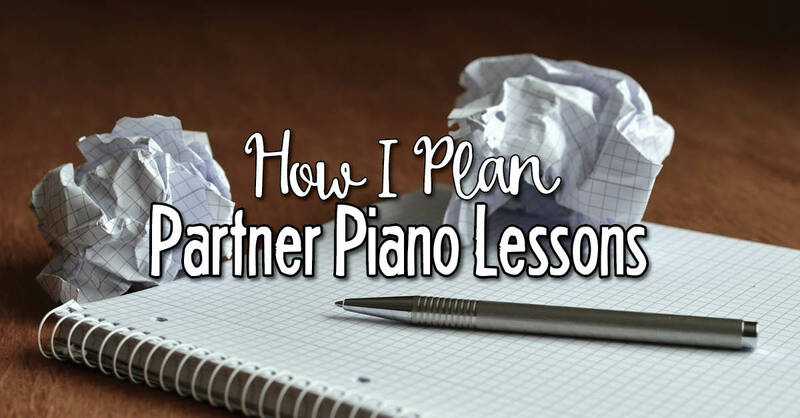 I’m sure there are many ways to go about making lesson plans for partner piano lessons. This is the way I have personally found to work in my studio. Disclosure: This post contains some affiliate links. Buying from one of these links does not cost you anything, but I do receive a small referral fee for sending you which goes towards the cost of running this site. Psst! 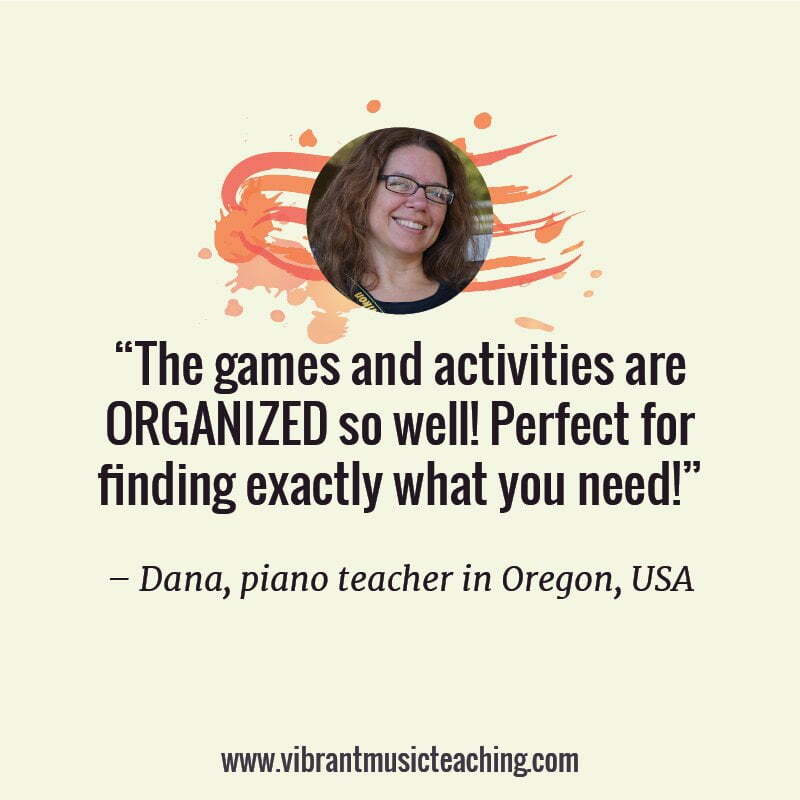 If you’re looking to teach in bigger groups instead of pairs, you might like this post about how I plan my piano party group workshops. Before I start planning, I need to know exactly what I want these students to be learning. This in turn decides the general categories that will go into my lesson plans. These are the categories that I include in all of my partner piano lessons. 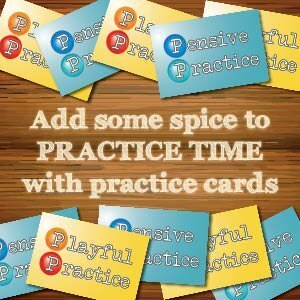 Rhythm – For most students this means using Rhythm Vocab Cards and tapping out the rhythms using Kodály rhythm syllables. Rote Pieces – My current favourites for beginners are ‘Repertoire by Rote‘ and ‘Piano Safari‘ books. I will also take special requests from students if there’s a particular pop or folk melody they want to learn. 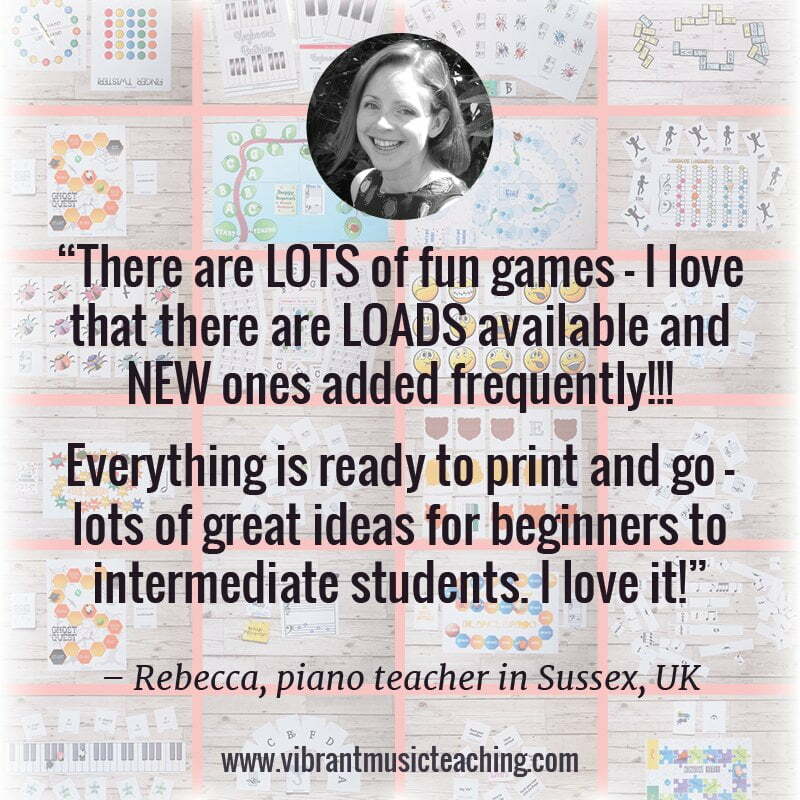 Reading Pieces – All my partner piano students are also learning to read along with their rote pieces. The method book choice depends on the students ages and what suits them just as it would with individual lessons. Off-the-bench Theory – This includes games, floor staff activities and flashcard challenges. 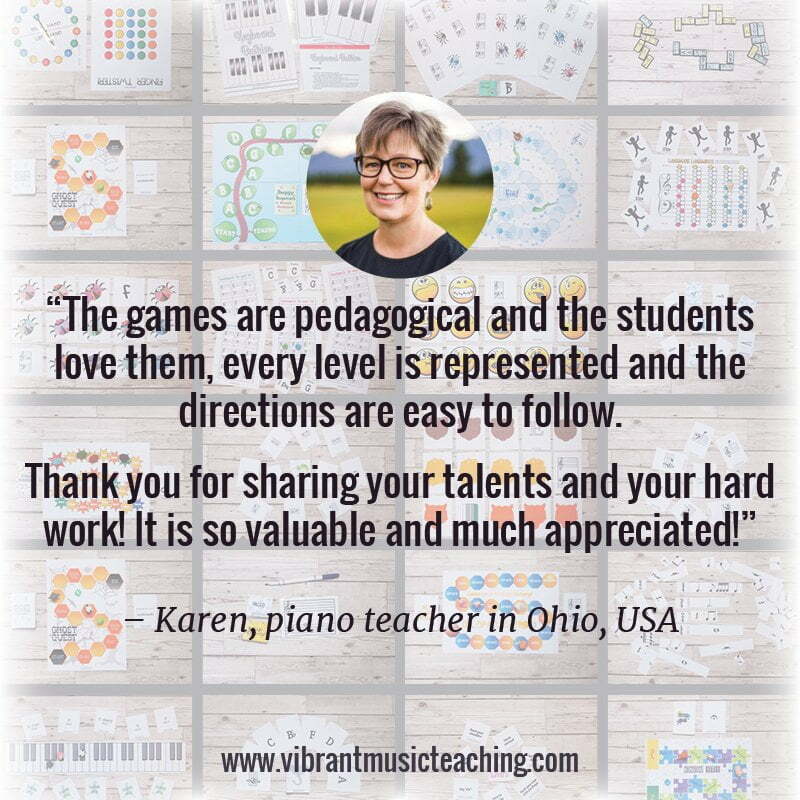 Kodály Singing Games – I love the collections from NYCOS for this, they’re designed for big groups but many can be adapted for my partner lessons. Colouring & Worksheets – A few minutes spent colouring or completing a theory worksheet isn’t a waste of time. Young students need to switch up activities regularly anyway so this can provide a much needed “brain break”. 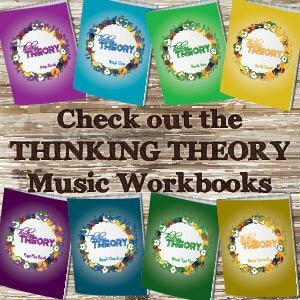 Technique – I might include exercises in transposing and various technical warm-ups as and when students are ready for them. Scales – Within the first few weeks all my students over the age of 9 would be starting the major scales using my scale level charts, and piano partners are no different in this regard. Chord Progressions – Chords are a fantastic thing to know from the early days of piano lessons. I also use this as an opportunity to introduce the pedal as detailed in the post ‘Beginner, Meet Pedal’ here. 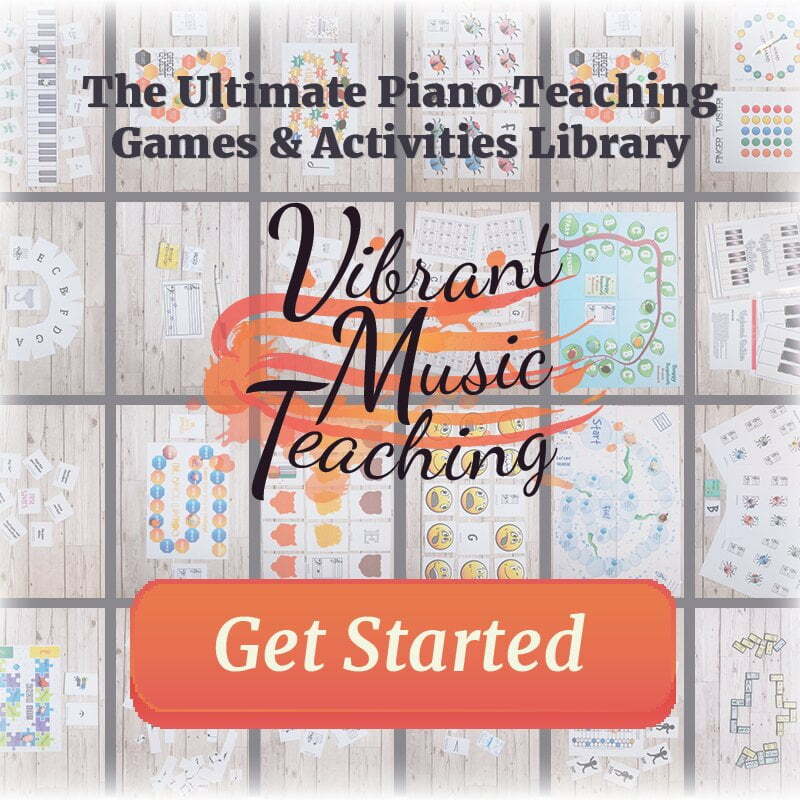 Once I have decided on the broad categories that will go into my lesson plans for partner piano lessons, I lay it all out and allocate rough amounts of time to each. This might look something like the chart below. This template will adapt and change as time goes in but it’s a good starting point for weekly lesson planning. Keeping my plan short, sweet and to the point allows me to glance at it during lessons without it disrupting the flow. Once I have this weekly lesson plan done, I go ahead and write out the assignment sheet for my piano partners. While during individual piano lessons I can write assignments as we go along – with two students this isn’t possible. If I’m unsure how much we’ll get through, I err on the side of too many assignments. It’s easier to just cross something off the list if we didn’t get to it than to add on something during lesson time. 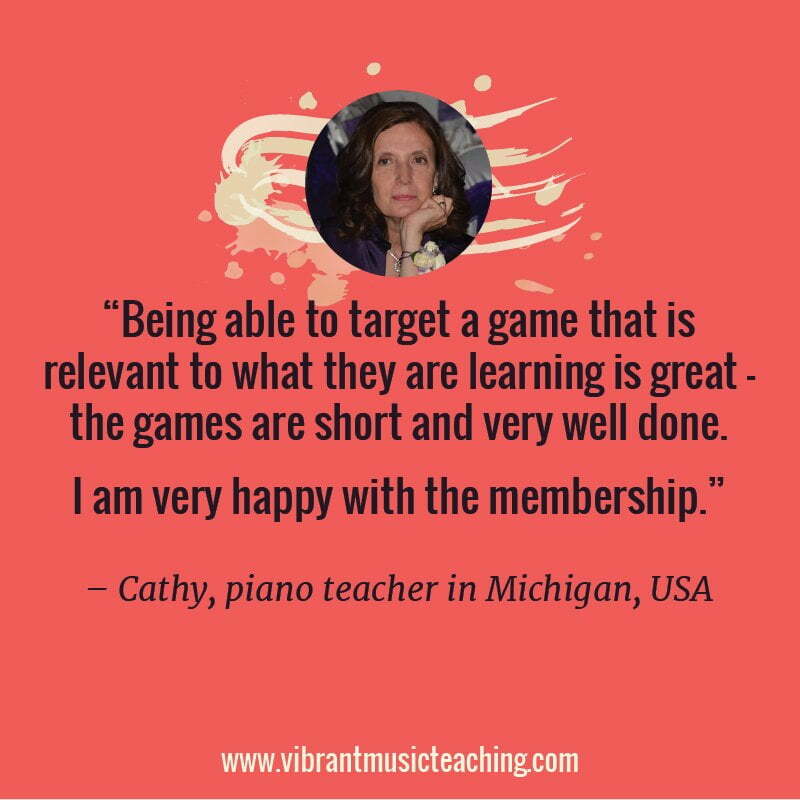 Having short and succinct lesson plans for partner piano lessons is also best for another reason. It allows me to be flexible. I’m not so invested in the plan that I feel I need to stick to it. It’s not possible to be as flexible in partner piano lessons as in individual lessons. You do need to keep the train fairly firmly on the tracks (you are technically outnumbered after all 😉 ). However I have managed to find certain degrees of flexibility too. Be prepared then prepare to pivot. I trust my gut during the lesson time. If I planned to get the kids off the bench next, but they’re focussing really well at the moment – I’ll go ahead and do our next reading piece right away. If they’re starting to get ants in their pants, I’ll for sure throw in an extra game I hadn’t planned on. It’s taken some getting used to, but I’m comfortable with this new format now. I’ve got my lesson plans for partner piano lessons pretty well sorted. 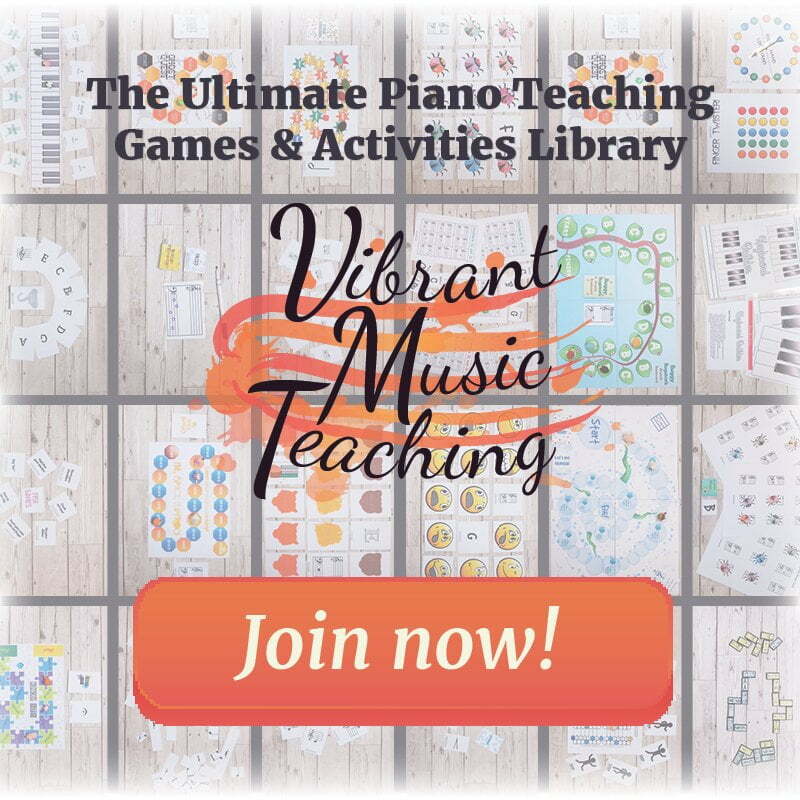 I hope it’s given you some food for thought on how you might go about planning for partner piano lessons in your studio. 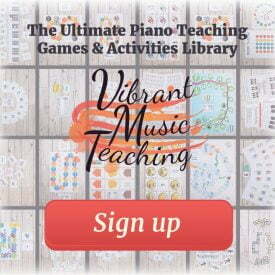 What else do you want to know about partner piano lessons? I’ve had a lot of different questions about this teaching format already. This is definitely not the last post I’ll write about partner piano lessons. So let me know what you want to know. Comment with your questions below and I’ll make a note of them for the next post. 1. What happens when someone has to miss a lesson? The other student just gets the whole lesson time, I assume. 2. Did you move your entire studio to this format at one time? And if so, how did you go about it? Did some parents and/or students balk at the idea? I loved the previous post about all the reasons it’s a great idea. Even if I don’t do it for the entire studio it might be a good change of pace for summer lessons. Thanks for sharing your thoughts and ideas! Hi Barbara, thanks for the questions. Doing this for summer lessons only sounds like a great idea too! I did not move my whole studio over, this is just something I’m doing with some students – not my whole studio. And yes, if one student misses the other just gets the whole time. Of course we need to catch the other up the following week but I don’t find this to be problematic. Hi Nicola, Thanks for this post (and the others too). I was thinking about possibilities starting partner lessons in January using Safari books. You mention Road Trip Book. I think it is a good idea, but I haven’t use them yet. Which book do you use, green or blue? Also, Are the parents welcome to the partner lessons when you teach? I would like a parent involvement especially for the beginner student. Curios how you do it. Hi Yelena. Yes I’ve used Roadtrip!, Piano Safari and Piano Pronto Prelude with piano partners so far. I think they’re all good choices. I will say to make sure you know the books pretty well – two students means much less thinking time for you in lessons. You’ll want to know exactly what’s next. Parents are always welcome in all of my lessons, however I don’t require attendance. I can see the benefit of both options although I can see it becoming a bit of a distraction in partner lessons in particular as that would mean a lot of bodies in the room. 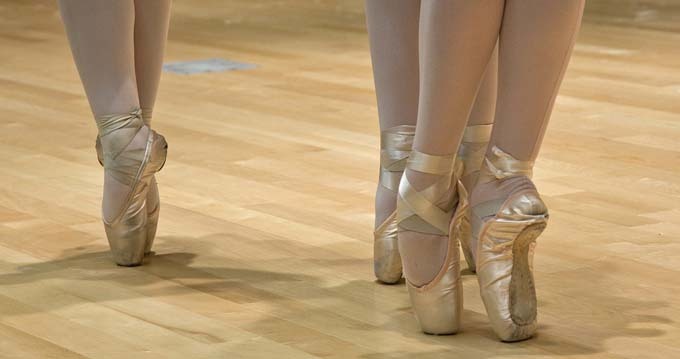 When you do partner lessons, do you need 2 pianos in the studio or do you work with each individually on the piano? It doesn’t seem like you can get to more than one piece or so with each student. That doesn’t seem to give them much to practice during the week. Maybe you misunderstood the plan Berdie? There are 4-5 pieces in that plan. Just like with one on one lessons, sometimes there will be more, sometimes less. I actually like the idea. As a pianist, I can tell you that the joy that comes from playing beautiful music is immeasurable. Using different strategy and techniques is always good points. Hi ! May I ask how much you charge for the 45 min partner and hour lesson compared to your private lessons? 45 minute partner costs the same as 30 minute solo. 60 minute partner costs the same as 45 minute solo. That way you’re making 1.5x your standard rate to account for the extra planning time. Nicola, for your partner lessons are they structured so a student comes for a 30 minute lesson then stays for 15 extra minutes while the next student arrives 15 minutes early so they have partner time for 15 minutes? Or are they 2 students together for the 45 minutes? The partner lessons with two 6-year-old boy students were going excellently, and then one student left for a 6-week trip with his family. 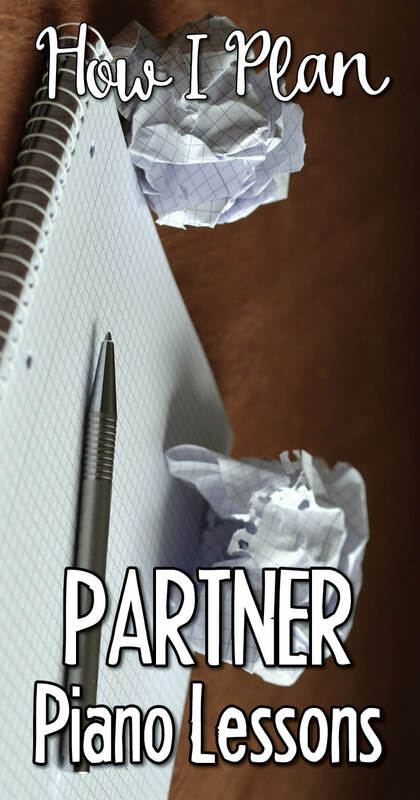 The one partner that took solo lessons (not liking them as well as the partner lessons) advanced almost an entire level, while the other student regressed a bit. Is there a way to remedy this current problem of one student being more advanced than the other? It is tricky when this happens. Aside from trying to catch student B up to student A’s level, I think the best approach is to make sure all activities work in several levels. So if they’re playing a piece, perhaps student B plays it separately and student A together. Or if it’s already a single staff piece – student A can be challenged to play it hands together, similar and contrary motion. Would partner lessons work for siblings? How can one deal with sibling rivalry that might occur? Would it be awkward for a 3 and 4 year old to learn together since the two ages vary? I can work, but not entirely as a partner lesson. You will need to spend some time working one on one with them so have some solo activities prepared for the other student.